Francis T. Fernan was the son of Leo P. Fernan and Ester M. Fernan, of Elmira, NY. 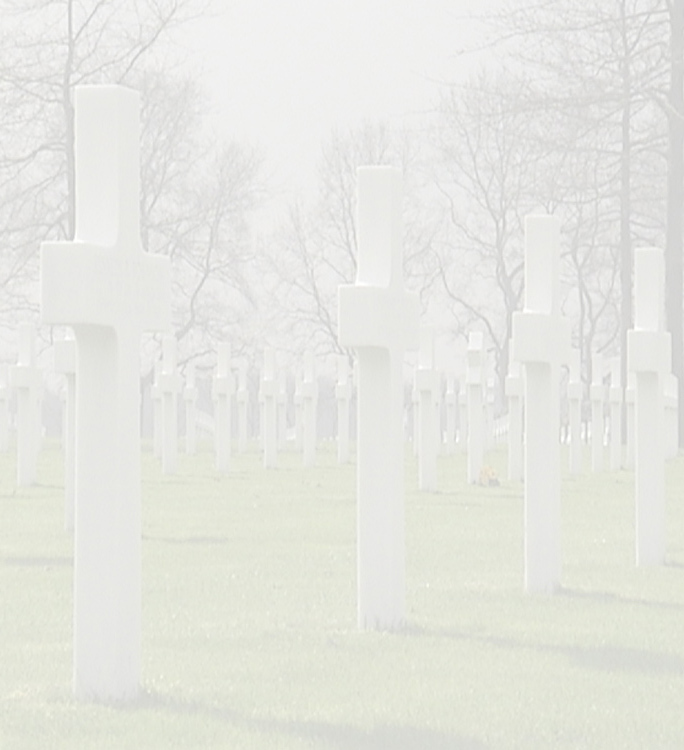 He was born in 1924 and had a brother named Richard J. Fernan, who served in the Philippines and New Guinea. Richard survived the war. Francis also had two sisters Margaret and Marianis. He was a high school athlete and football player. After his graduation in June, he signed up for the army in December 1942. He volunteered for the airborne troops and became a member of the 501st PIR. He had his jump-training at Camp Toccoa, GA and he received further training at Fort Benning, Ga and Camp Mackall, NC. In 1943 he was shot by a military policeman during the riot in Charlotte N.C. in 1943. He disarmed the M.P. but was wounded in the leg. He didn't turn himself-in for medical attention until about 4 days later, when his wound became so serious that he could no longer drill with his platoon. The Charlotte riot happened when members of a Hawaiian U.S. Army unit fought with parachutists from the 501 in the town of Charlotte. In January 1944 the 501st PIR left for England to prepare for the invasion of Europe. Cpl. Francis Fernan, member of an 81mm mortar squad, landed on Drop Zone 'D' near Angoville au Plain, France, on the Normandy drop. He fought between Angoville and St Come du Mont on the first 3 days of the Normandy Invasion, then was in the attack on Hill 30 southeast of Carentan, on 12 June, 1944. The rest of the time in Normandy combat was spent in the area south of Carentan, near la Billonnerie. 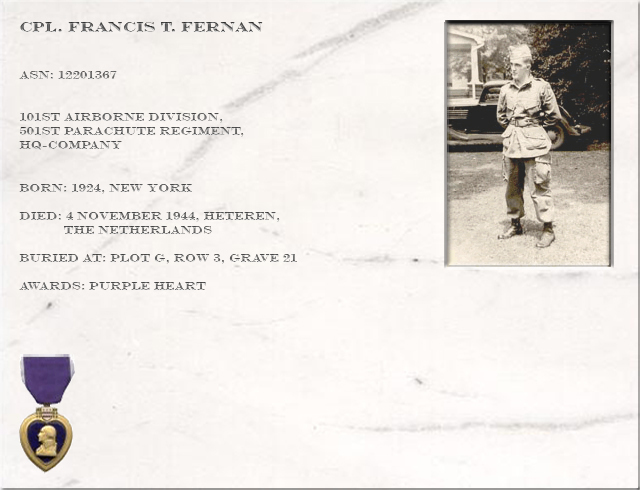 Fernan parachuted into Holland on 17 Sept, 1944 (operation Market-Garden) and was in the fighting to hold Veghel from 17- 28 September, 1944. After that, things quieted down in that sector of Hell's Highway and the 501 moved north to the Betuwe, near Heteren on 4 or 5 October, 1944. They remained in defensive positions along the main dike there, until late November, when the 501 was withdrawn to Mourmelon le Grand France for R&R and re-supplying. In 1942, the 82nd Infantry Division at Camp Claiborne, LA was split in two, to form two new Airborne Infantry Divisions. The 82nd Airborne and 101ste airborne division. Both divisions were stationed at Ft Bragg, N.C. before being shipped overseas. The 82nd departed first, heading to North Africa. The 101st absorbed one parachute regiment, the 502nd, which had been originally activated as a battalion in 1941. This became the original Parachute Infantry Regiment (PIR) on the Table of Organizations & Equipment (TO&E) of the 101st Division. The division's original organic units were artillery and support battalions. In early 1943, the 506th PIR was attached to the division, which sailed for the UK in September aboard 3 different transport ships. A period of intense maneuvering and training, including practice jumps, ensued in England. The division was preparing for a landing on the Nazi occupied European continent, but the exact location was still unknown. The 501st PIR, which like the 506th, had initially trained seperately, was also attached to the 101st Division in January, 1944, in England. Although both regiments wore the 101st Airborne shoulder patch in battle, the 501st and 506th were only members by attachment until after WW2 ended. The 506th was accepted as a TO&E part of the division after VE-Day. The 501st was deactivated in July, 1945, having never been an official organic part of the division. When the 101st was reactivated in 1956, the 501st was incorporated as part of the TO&E. In the spring of 1944, General Bill Lee, the original commanding general of the 101st Airborne had to relinquish command due to a heart ailment. His replacement was General Maxwell D. Taylor, who would lead the 101st through combat until the end of WW2. The 101st participated in Exercise Tiger at Slapton Sands on the south coast of England in April. In June, the Division landed in Normandy on, and behind the Utah Beach area. Paratroopers were dropped onto three landing zones, and relatively few troops of the 101st landed by glider. The rest of the division landed by sea. The three parachute regiments captured the four elevated roads leading inland from Utah Beach and secured various key terrain objectives behind the east coast of the Cotentin Peninsula. This was done with great success, and a new objective was added to their agenda: the taking of Carentan, France. This not only aided in linking the Utah and Omaha beachheads, it helped prevent the Germans from driving through to the coast in an area which would divide the Allied landings. The 502nd 3rd battalion won particular honors in it's costly battle to secure the road into Carentan from the north-this became known as 'Purple Heart Lane', due to the many American casualties taken there. A Congressional Medal of Honor (CMH) was awarded to LTC Robert Cole for his leadership in a bayonet charge at the south end of the causeway. This was the first of only two CMH's awarded to 101st personnel in WW2. The 101st took Carentan and the 506th, reinforced by CCA, 2nd Armored Division, defended it against counterattacks by the 17th SS division and the 6th Para Regiment. The 101st was withdrawn from the lines in late June and sailed back to England on LSTs in July. After several false alerts, they invaded by air again in the Netherlands on 17 September 17, 1944. Their mission in Holland was to hold open a corridor for British armor to drive north and relieve their paratroops who had landed at Arnhem. Although the mission failed to achieve it's long range objectives, the 101st as well as the 82nd Airborne Division accomplished all missions assigned to them. Once again, fierce fighting raged and another 101st man won the CMH. Pfc Joe Mann of H/502 laid on a German grenade to save his buddies; the CMH was awarded posthumously. 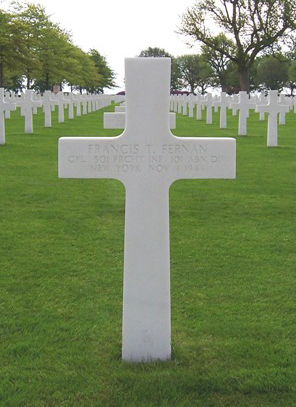 On the 4th of November 1944 the 81mm mortar squad of Cpl.Francis Fernan was dug in behind the main dike at Heteren. The squad leader, 1Lt. Alton Phipps, allowed the squad to dug in to far away from the dike. So the dike didn't cover the squad. The Germans on higher ground on the north bank of the Neder Rhine could spot their firing positions and sent in counter battery fire that wounded Cpl. Fernan. He died of shock on his way to the aid station. He was buried in a US cemetery about 5 miles south of Arnhem, later he was brought to his final resting place in Margraten. The grave of Cpl. 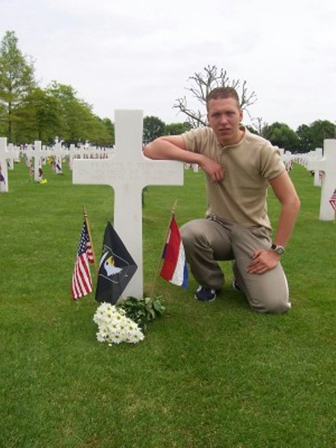 Francis T. Fernan is adopted by Rick Mommers, The Netherlands. If you have more information about PFc. Alfred Corgan then please contact the webmasters of this site.